In Linux, the penguins have released an operating system which will ensure forever their dominance over the stupid man-animals. Linux is specifically designed to be incomprehensible to the human brain. Our task was further complicated by the fact that neither Nate nor I have any brain worth mentioning at all, human or otherwise. If I were to make a long story short, I would say that "in the end, we got Linux working." But I no interest in doing any such thing. Making a long story short may be an act of singular kindness to you, but it's a bad way to put up a new article on my website every day. So yes, to make a long story short, we did get Linux working. To some degree. Seven times. Yes, we installed Linux seven times: a few times to try installing different versions, sometimes because it ran really slow or not at all, and on one unfortunate occasion, after we had gotten it working perfectly, just from force of habit. "What is the vertical refresh rate of your monitor?" "Specify a RAMDAC range for your graphics accelerator card." "In 1000 words or less, please define 'clock chip'." "Considering that today is opposite day, would you like me to blow up your monitor?" "How many BogoMIPS do you have?" You know what? I don't know how many BogoMIPS I have. 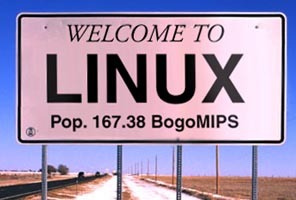 I'm not afraid to admit that I don't even really know what a BogoMIP is, except that every time I start up Linux, it tells me that I have a different number of BogoMIPS, ranging from 45.61 to 163.37. From this I can infer that BogoMIPS are constantly escaping and infiltrating my computer. Combine that with the birth and death rates of my resident BogoMIP families, and you can't blame me for not knowing exactly how many I have, down to the last hundredth of a BogoMIP. To get a valid number, I'd have to line them up and count them, and even that wouldn't be accurate because they're always cutting little capers like hiding behind the power supply and running from the end to the beginning of the line so I count them twice. At this point, Nate turned to me. "Hey Paul," he said. "I have a question. Why did we just install Linux? We don't know Linux." There followed a long, tension-filled silence. Dense black smoke poured out of our brain pans. "We'll figure it out," I said finally. "I heard that Linux uses some of the same commands as DOS. We used to use DOS all the time. We were wicked good at DOS." Our memory in this area may be a little selective. When you get down to it, all we used DOS for was to play Ultima 4, and so the only DOS commands we actually know are "cd ultima4" and "ultima4.exe". Nevertheless, we spent the next couple of minutes trying our best to figure out this new, strange OS. userfb@tertiarydrive/dev/md43 /root ]# work, damn you! userfb@tertiarydrive/dev/md43 /root ]# work, you hunk of junk! Oh, so the problem is with Linux, is it? userfb@tertiarydrive/dev/md43 /root ]# hello? is anyone there? I'm right here, asswipe. Why don't you try using actual Linux commands. Listen, kid, isn't there a Windows box you should be playing on? Or some traffic you could be playing in? "This isn't getting us anywhere," I said. "Let's try hacking!" exclaimed Nate. To make a long story short, we all have 56 hours to live. Sorry about that!